Home Health Could using sunscreen at NIGHT prevent skin cancer? Could using sunscreen at NIGHT prevent skin cancer? Applying ‘night-time sunscreen’ after a day in the sun may help reduce the risk of developing skin cancer, according to scientists. Researchers have found that much of the damage caused by ultraviolet light from a day on the beach occurs hours after the sun has set. They discovered that energy absorbed from the sun by skin cells called melanocytes is transferred to the DNA in the dark, causing it to deform. The scientists believe that a new type of ‘evening after’ sunscreen containing vitamin E could be developed to block this transfer of energy. Professor Douglas Brash, a dermatologist at Yale University, said: ‘So our understanding has been that you put on sunscreen before you go out into the sun and that protects your skin. In tests using mouse and human melanocytes, experts found UV radiation from sunlight causes enzymes in the cells to create two chemicals that react together. These then excite electrons on the melanin with energy. 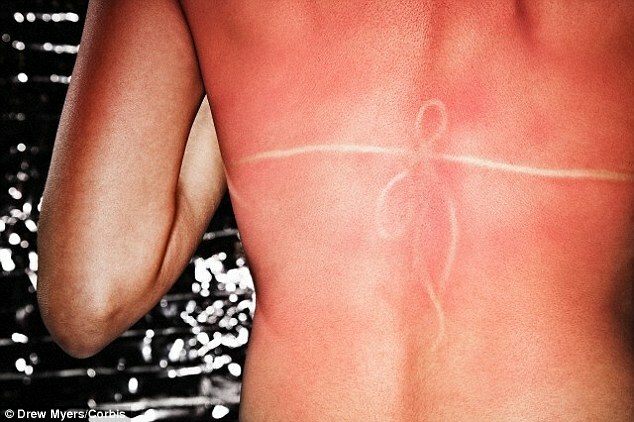 This means the melanin effectively absorbs some of the energy from the sunlight. However, in the dark the melanin transfers this energy to the DNA to cause the same damage that can occur in sunlight. 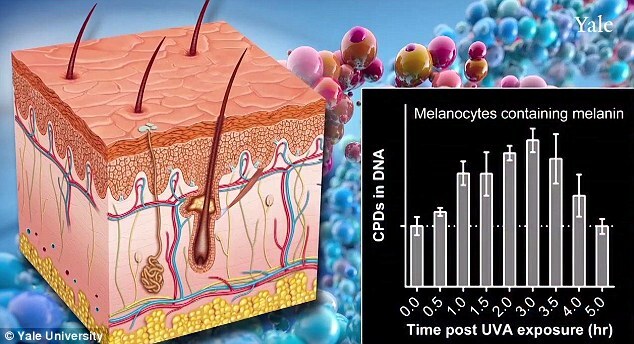 In melanocytes without melanin, the damage to the DNA only occurred during sun exposure and not afterwards. ‘Here you have a different situation where what you want to do is add something after you leave the beach or tanning bed that protects you for several hours after. ‘You could imagine designing chemicals that dissipate that energy before it has a chance to get to the DNA. Ultraviolet light is thought to damage DNA by causing a ring-shaped structure to from in the DNA, known as a cyclobutane dimer. This prevents the genetic code from being read properly and leads to faults in the functioning of the cells, leading to them becoming cancerous. 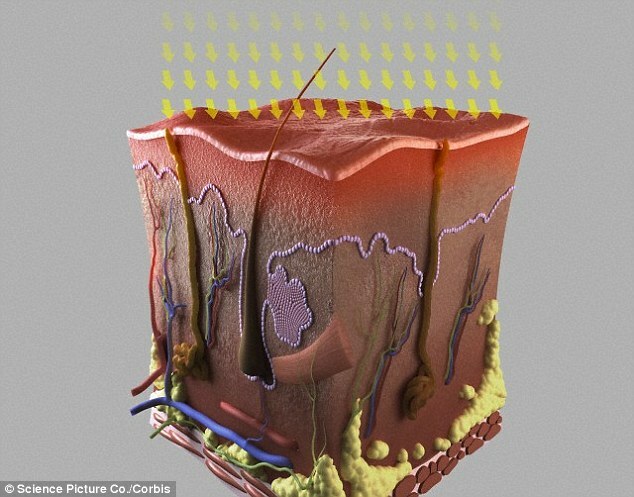 Melantocytes produce a pigment called melanin that was thought to help protect the skin from ultraviolet light. People with blonde or red hair, and fair skin tend to have less melanin in their skin and are more vulnerable to skin cancer caused by sunburn. Scientists recently unlocked one of the secrets of how coral shields itself from harmful ultraviolet rays – and they hope it could create ‘sunscreen in a pill’. A single pill could provide weeks of protection for the skin and eyes, cutting the odds of cancer, removing the need for creams and sunglasses, and keeping wrinkles at bay. However it would do nothing to bronze the skin, meaning sun-worshippers would have to resort to fake tan if they want a ‘healthy glow’. The scientists at Kings College London took their inspiration from samples of coral collected from Australia’s Great Barrier Reef. It was known that the marine organism can shield itself from the sun’s rays and it was thought that the protection came from a compound made by algae that live within it. The researchers found the algae makes a compound that is transported to the coral, which then modifies it into a sunscreen that protects it from UV damage. However, Professor Brash and his team, whose results are published in the journal Science, found that it is melanin that is also responsible for this overnight damage. 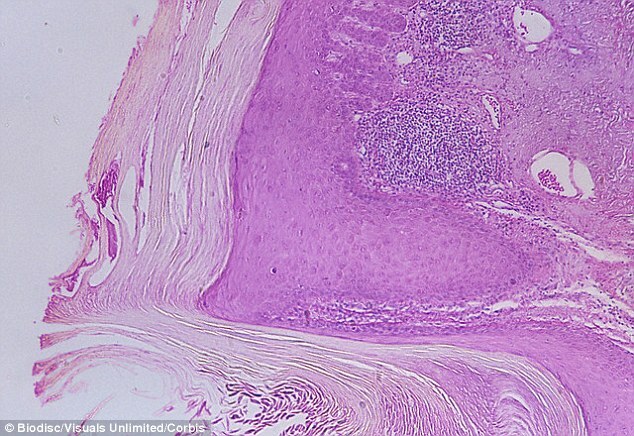 In tests using mouse and human melanocytes, he found UV radiation from sunlight causes enzymes in the cells to create two chemicals that react together. Professor Brash said: ‘When sun hits your skin normally what happens is that it makes damage to your DNA in a millionth of a millionth of a second. ‘In melanocytes, which are the cells that make the pigment that is protecting your skin, that is not all that is going on. ‘You are getting the same kinds of DNA damage in your skin for hours after the exposure has ended. ‘What is suprising is that melanin is actually doing things that can cause cancer as well. Professor John-Stephen Taylor, a chemist at the Washington University in St Louis who studies DNA damage caused by the sun, said that improved daytime suncreens could also help. He said: ‘Researchers have long sought methods to prevent skin cancer induction, and the results of this study indicate that sunscreens should aim to minimise exposure to both UVB and UVA. As suggested by the authors, UV DNA damage arising in the dark might also be reduced by agents that scavenge or interfere with superoxide and nitric oxide production or that quench the excited triplet-state intermediates.